Happy Thanksgiving to my American friends! Since we already had our turkey day in Canada in October, today was just another run of the mill day. Yet another “What I Ate Wednesday”! Hopefully these posts aren’t boring, but like many, apparently I’m a creature of habit and eat many of the same things. Generally, I would like to have more variety in my diet, but a lot of it has to do with convenience, and to be honest, I’m not the most creative at times. With a busy toddler around, I don’t have much time to plan and think about what I’m going to eat…its very much grab-n-go. I know many are big into meal planning. I’ve tried to do that in the past and plan out all my meals for the week, but it always fell by the wayside. The only luck I have planning in advance is dinners, and snacks. 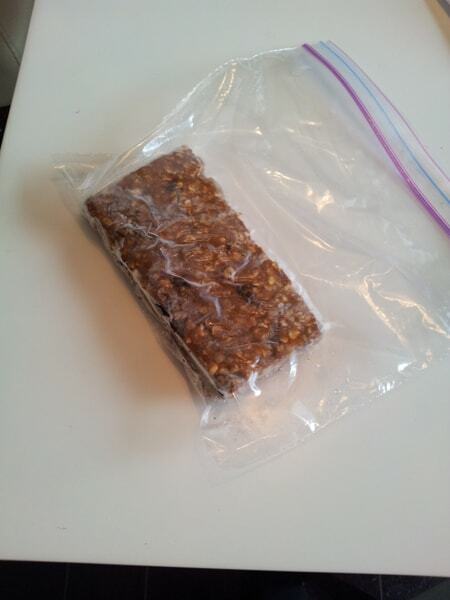 As I’ve mentioned before, I always have protein bars on hand…usually my homemade ones in the freezer. So worst case scenario, I can grab one of those. So as usual, I quickly put together some eggs and toast with butter. I was using the ends of the bread on a couple loaves. As per usual, did school drop off and headed to the gym with the wee one. Once we were done, came home and I grabbed a protein bar out of the freezer. 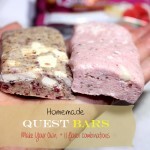 A couple days ago, I made another batch of No-Bake Chewy Better Than Store Bought Protein Bars but I substituted the vanilla whey protein for chocolate, and subbed the raisins for dried cherries cut up. A couple hours later I was ready for lunch. I had 1 brown rice tortilla left (from Trader Joe’s) so I decided to have a quick wrap. I just warmed up the tortilla in the microwave until soft (30 seconds), then topped it with some rotisserie chicken, spinach, tomato and about 1 Tbsp of sweet chili sauce. I really love sweet chili sauce. Its not the best, as its so high in sugar, but in small doses its not that bad. In 1 Tbsp its 6 g sugar. Then around 3pm, I was starting to get hungry again. I had this protein shake yesterday and it was so good, so I wanted it again. I just 1 scoop of the Whey Gourmet Chocolate Peanut Butter, added a bunch of ice and about a cup of unsweetened vanilla almond milk, and 5 drops vanilla stevia (Nunaturals brand), and a heaping teaspoon full of natural peanut butter. Blended it in my Blendtec and voila! Side note: If you’ve been contemplating getting a really good blender, Blendtec is having a great sale for the holidays. I wanted a Vitamix for years, but couldn’t get past the hefty price tag. After I did some online comparisons, it appeared that the Blendtec is totally comparable to Vitamix. I love mine, whenever I use it, it feels like I’m in a Jamba Juice! The offer is on their refurbished model of the Classic. Sometimes people are leery about the word “refurbished”, but it still has a 7 year warranty, so they stand behind their products. With the price being $279.95, you really can’t beat that, especially if you’ve been contemplating a high end blender but don’t want to pay $600.00. Get the info on the deal here. I took out some chicken breasts to thaw this morning, so I knew I’d be making some sort of baked chicken. I decided on making some Dilly, Lemon & Maple Baked Chicken. 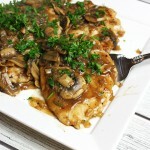 Its turned into one of our favorite chicken main dishes. On the side, I did some roasted cauliflower, with a bit of olive oil, Parmesan cheese, garlic powder, dried parsley and a bit of salt & pepper. Tossed it all together, and baked at 425 for about 20 minutes. I also had a bit of brown rice/quinoa mix. I got these packs at Costco. They came in a box, and the brand is Seeds of Change. We like them! I tried another trial of a healthier copycat of the Starbucks Gingerbread Loaf. I think I have a winner this time around. So I ate a piece of that cause of course I had to make sure it was good. I also made a double batch of the Best Ever Blueberry Muffins, so I had one of those too. Other than that, I may have a bit of greek yogurt later with stevia and granola if I’m hungry…otherwise, I might just stick with some tea.